Stop this unnecessary and painful practice from continuing on America's farms. For the livestock destined for slaughterhouses in America, aren't short lifespan and often horrendous living conditions enough? For many farm owners, it's not — and they take the cruelty even further by docking the poor animals' tails. Some producers dock animals tails because when they are closely confined they tend to step on each others' tails. But livestock shouldn't be closely confined in the first place — so tail docking makes it easier for these farmers to practice inhumane methods. Tail docking causes extreme pain for the animal, results in lifelong discomfort and often, infection. There is no scientific basis for this practice. H.B. 1697, if passed, would ban the method of tail docking completely. Sign in support of eradicating this painful and unnecessary practice. I am very upset to learn about bovine tail docking practices taking place on farms across America. As experts in bovine science, farmers have a responsibility to the welfare of the animals they own — and through this inhumane practice farmers are continuing to shirk that responsibility. Tail docking is a common practice in the livestock industry as it can allow more animals to one enclosure and stop them from stepping on each others' tails. However, tail docking causes major health defects that can cause extreme pain and discomfort and lead to infection. In the livestock world, it's profit over humanity. But that's simply not fair to the animals. 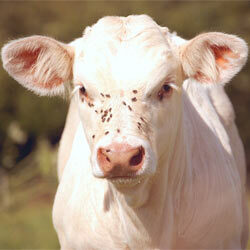 Please continue to fight for farm animals by seeing that this bill is passed into law. Victory! In January 2017, the National Milk Producers Federation Board (NMPF) approved a ban on tail docking.